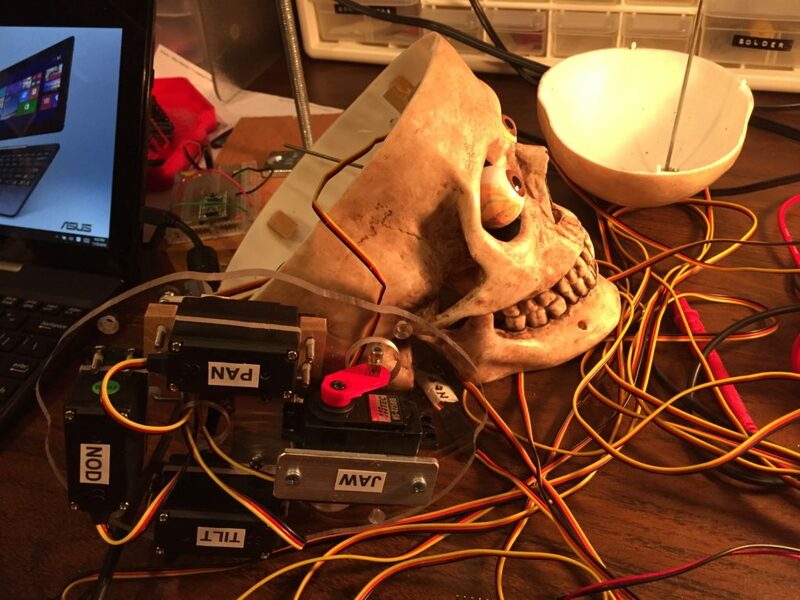 Now, if you put this project together from scratch, it’s pretty expensive, due to the cost of the 3-axis talking skull, but if you are looking to re-purpose one you have, or a similar device, then you may want to develop a similar project. 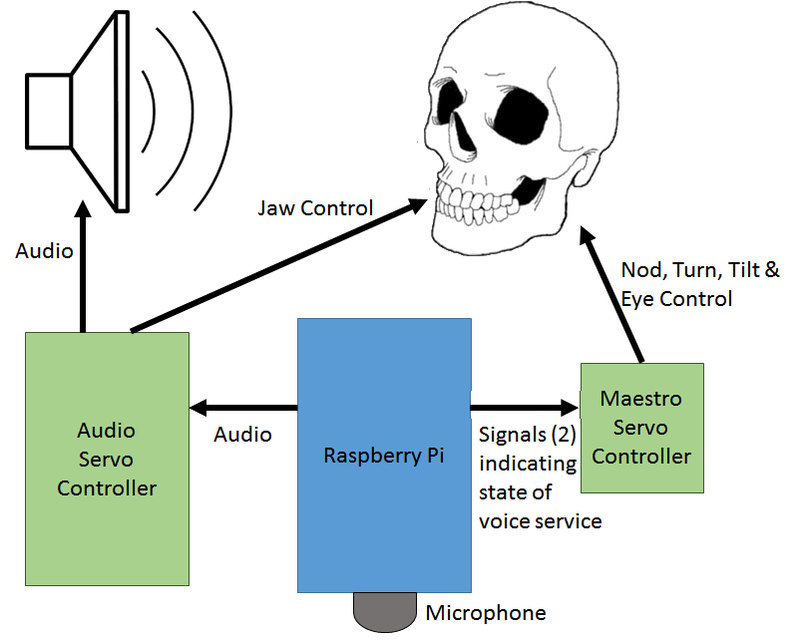 The key elements are the talking skull, a Raspberry Pi and the AlexaPi software for turning the Pi into an Alexa client device, the audio servo controller for turning the output sound into servo commands for the jaw, and the servo controller for controlling the nod, turn, tilt, and eye servos of the skull. 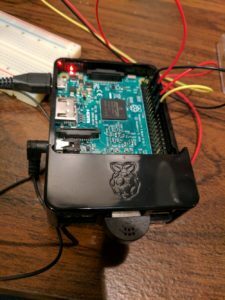 The AlexaPi software provides output to two GPIO pins, intended to light up LEDs as the Pi hears the wakeup word, listens to the input, gets the response from the Amazon Alexa service, and then speaks the response. All the directions for AlexaPi are on the creator’s GitHub site. For this project, we also linked the same pins to input pins on the Maestro servocontroller. The Maestro I used allows pins to be used as output (primarily for servos, but also for other purposes) or as analog inputs. Other models also have digital input pins. By reading the status of the input pins, we know which state to be in, as there is a separate routine of head motions for inactive, wake, listen, get response, and speak response. 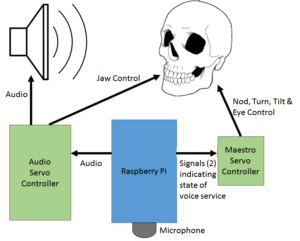 The servo sequences are developed using the GUI-based controller software provided by Pololu, and then custom control commands are added using their stack-based scripting language. The partial script is included at the end of the article. The short first section that is provided is the control code I wrote, the rest (not shown) are the automatically generated subroutines based on the sequences I defined using their GUI driven software. 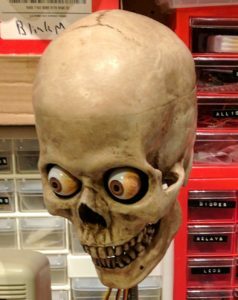 The skull motions for each state are predefined and fixed (the routines are looped as needed for the typically longer lasting states (get response and speak response). 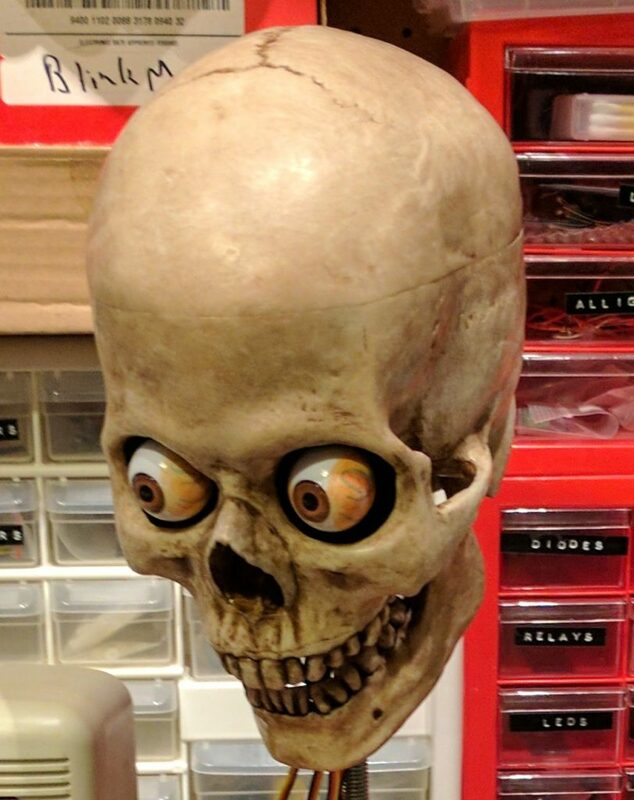 The one key tip is to slow down the servos in order to look more realistic. 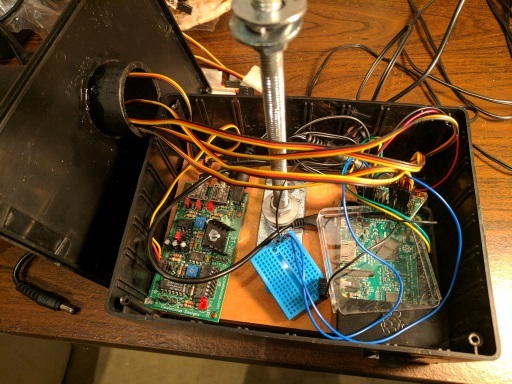 The Maestro controller software lets you limit the speed and acceleration of each servo, and with the exception of the jaw servo, which had to have quick response to changing audio, I set both the speed and acceleration values to 20. 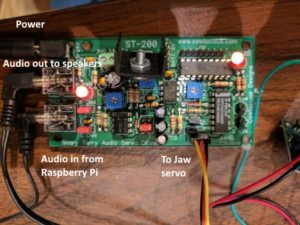 The audio servo driver board converts the audio put out by the Pi into servo commands for the jaw, while also passing the audio through to the powered speakers. Others have developed their own software do drive motor (rather than servo) based devices such as Billy Bass and Teddy Ruxpin, based on the amplitude of the sound. 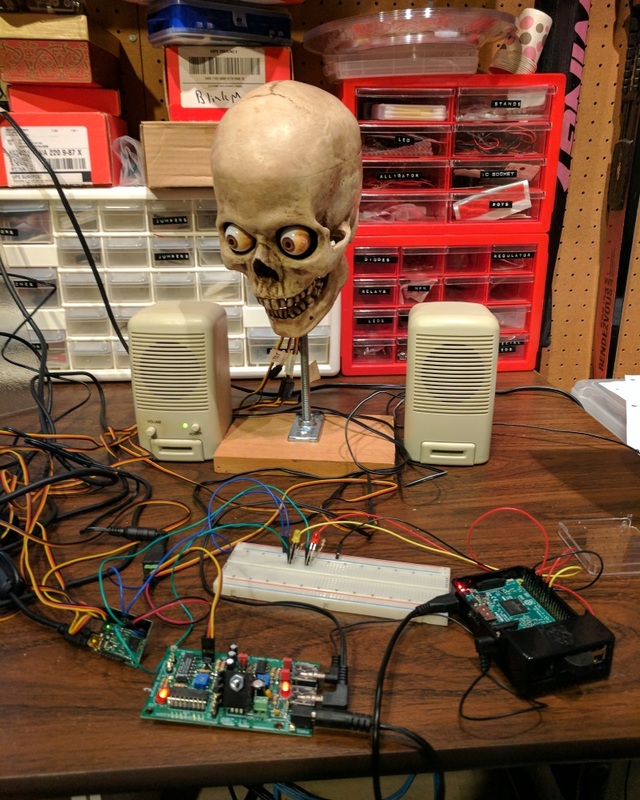 I’m sure the same could be done to drive the jaw servo by extracting the volume of the sound, but I already had an audio servo driver board that is otherwise unused except for Halloween, so I used that. Rather messy (mainly with the 5 servo cables), but it all fits in the box. 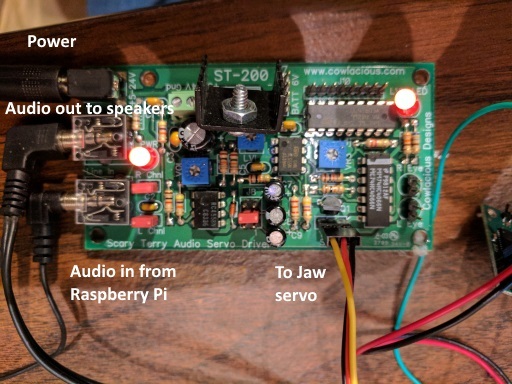 Kinobo – USB 2.0 Mini Microphone – You need a microphone for input, and I was quite happy with the performance of this one, considering it only cost $5.25! 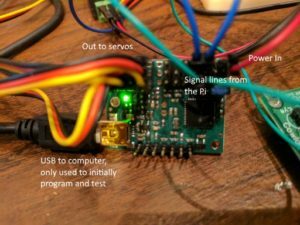 Pololu Mini Maestro Servo Controller – I used the 12 channel version, larger versions should also work. Misc., including project box, LEDs (optional), resistors (optional, if LEDs used), breadboard (optional, if LEDs used), PVC pipe, and jumper wires. Pololu’s Maestro Controller Software – I used the Windows version, but they have versions for Linux as well.